In spite of being one of the “Seven Natural Wonders of the World,” humans have not always seen the Grand Canyon in a positive light. First seen by Europeans in the year 1540, the canyon was not comprehended easily. Throughout the entire exploratory era, lasting nearly 320 years, conquistadores, explorers, trappers and miners viewed the canyon as an obstacle to travel or even useless. None of these early visitors ever returned a second time. However, when the first geologist laid eyes on it in 1857, he issued a siren call to humanity that it was something quite special on our planet. Every geologist who followed returned again, announcing to the world that the Grand Canyon was to be revered. 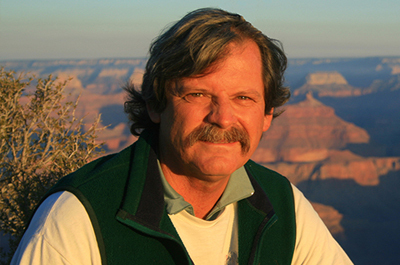 Wayne Ranney is a dynamic speaker who engages audiences by including the humanities in the topics of landscape development and Arizona history. 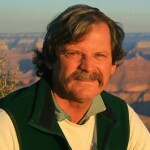 A resident of Arizona since 1975, Wayne lived at the bottom of the Grand Canyon for three years before attaining degrees in geology from Northern Arizona University. He has traveled to nearly 90 countries worldwide and has lectured on all seven continents. His programs are insightful, participatory, and thought provoking. He has extensive experience in the geological sciences but brings the human element into his topics, showing how new ideas are conceived, developed, challenged or accepted. He is also an award-winning author of numerous books.